(This product without bluetooth calling function,with no power amplifier,only connect to an external amplifier can it use). Support signal switch directly.Support USB, TF. 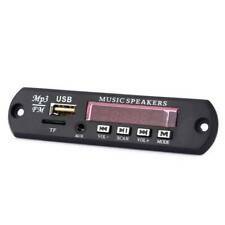 Support USB/TF/Bluetooth/FM/LINE switch.MP3/WMA,WAV lossless music decoding chip. Coby 1 GB MP3 Audio Player USB 2.0 Earphone Bundle, Up To 500 Songs. Plug & Play. Condition is New. Shipped with USPS First Class Package. High definition up to 1280 720 makes pictures super clear. Product type: MP5 Player. 1 MP5 Player. Multiple Sources - It supports TF card, AUX input, USB devices. Bluetooth Connection - Through Bluetooth connection, you can play videos in your phone by it. $Car Stereo Bluetooth Audio 1 DIN In-Dash FM Aux Input Receiver SD USB MP3 Radio Features ---100% Brand New, high quality ---Built-in Bluetooth function on microphone. ---Hands-free calls ---Supports Advanced Audio Distribution Profile ---Off time display function ---Digital high-quality FM stereo radio, ---Preset 18 stations (frequency: 87.5-108 MHz) ---Support USB / SD / MMC card reader ---Support Audio: MP3 / WMA / APE / FLAC / WAV, etc. ---Support folder function ---Support breakpoints and ID3 Play ---Support Remote control ---Rotary Volume Control ---MP3 randomized, 10 track up / down playback ---Electronic control volume treble, bass, balance and fader ---Multiple EQ Scene Selection: jazz, rock, pop, classical, etc. BOSS AUDIO 616UAB. Boss 616UAB In-Dash Receiver. The Aux Input allows you to connect to the audio output of an external device such as an MP3 Player or Smartphone so you can enjoy your music through your system. Digital high-quality FM stereo radio. - Built-in Bluetooth microphone. - Support Audio: MP3 / WMA / WAV, etc. - 1 x car MP3 player. - Support USB / SD / MMC card reader. - Supports Advanced Audio Distribution Profile. Video: RMVB/RM (RV8/9), h.263, h.264 (MOV/M4V), MPEG-1/2 (VOB), MPEG-4 (XVID / DIVX), WMV7 / VC-1, MKV, AVI, TS/TP, VOB, PMP, FLV. Audio: MP3, WMA, AFE, FLAC, OGG, APE, AAC, AC3 AND DTS music format. Picture: JPEG, GIF, BMP, PNG. (Dual 2.1A USB Car Kit FM Transmitter MP3 Player. Built-in FM transmitter. Using FM transmitter function 1) Plug the FM transmitter into your vehicle’s cigarette or power port. Support USB disk and Micro SD card.